Here is everything you ever wanted to know about pull-ups: what pull-ups are and how to get started on them, what to do when you don’t have a bar and how to get better at pull-ups when you are stuck. Just some of the muscles trained by doing pull-ups. But what makes pull-ups really great is that the latissimus is not the only muscle that benefits, a lot more are working along and share the goodness: your shoulders, the middle and upper back, the neck, biceps and forearms. Is There A Difference Between Chin-Ups And Pull-Ups? Yes, there is. 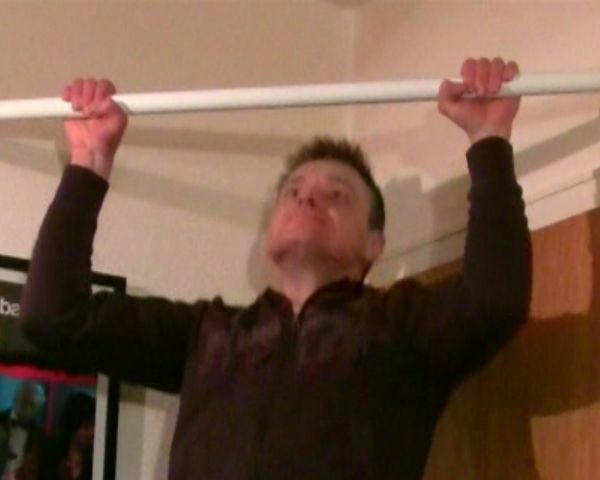 A chin-up is when your hands are facing you when you pull yourself up. During a pull-up the hands are facing away from you. 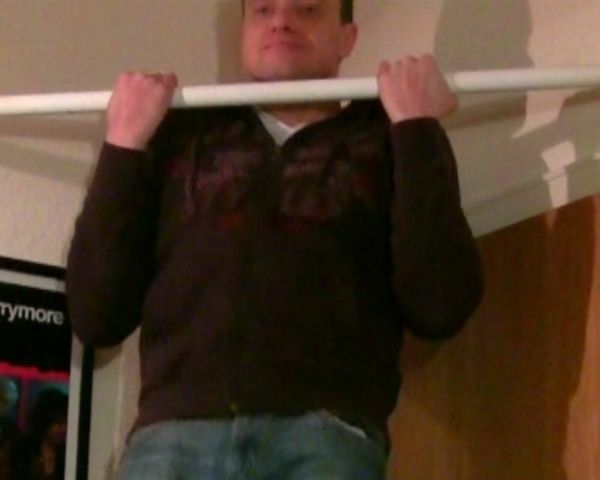 The chin-up involves more biceps, making them easier. How Do I Start Doing Pull-Ups? You should do this 2 – 3 times per week, preferably as part of a complete workout like this one. A broad back with a chicken breast on the other side always looks a bit ridiculous. Okay, I Want To, But I Don’t Have A Bar! 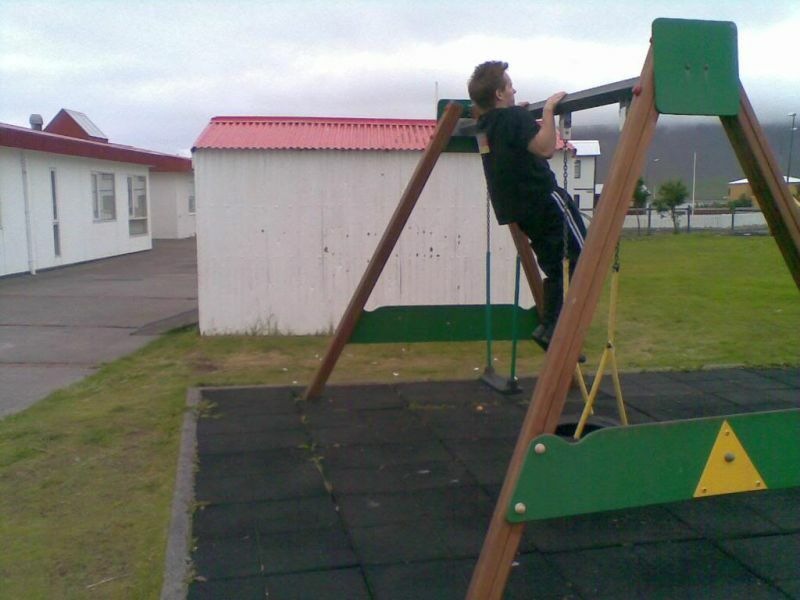 Playground swings are usually built really sturdy. Grandma used to put clothes on these, you don’t. These are just two examples of pull-up bar substitutes. Check here for many, many more. Nah, Too Uncomfortable, I Want A Real Bar! Which One? Each has its unique advantages and disadvantages and you should carefully weigh what will work best for you. The first you can install in a corner and isn’t in the way when it’s not needed, but you can’t install it on drywalls and such. The second type allows for a wide grip, but takes up an awful lot of room to store, while the third needs a minimum of space when put away, yet doesn’t allow for a wide grip and may also damage the frame. Er, “Wide Grip”? Is That Important? 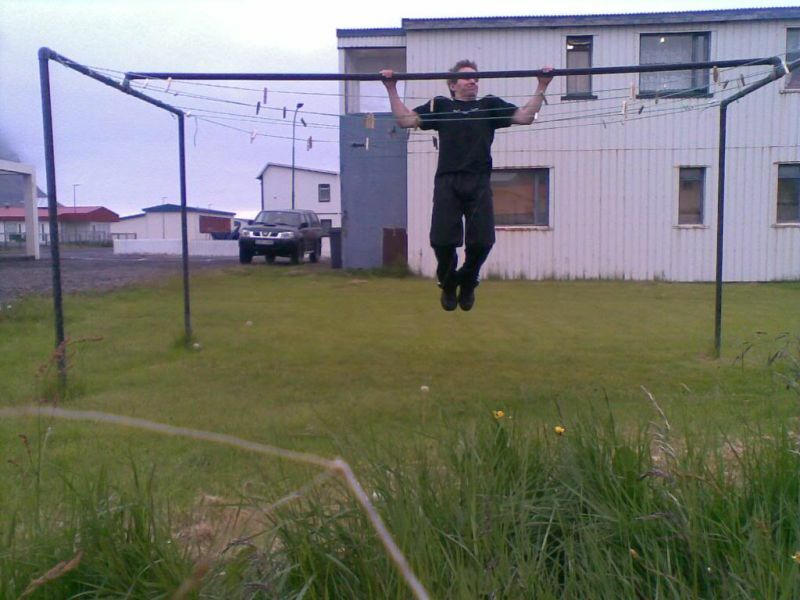 Well, you normally do pull-ups with a grip that is about shoulder-width, maybe a little more. Some people, however, believe that a wider grip activates the latissimi more, although I never saw any proof for that. To me, a wide grip simply narrows the possible range of motion, but if you want to find out how the different grip widths work for you, you need a bar that allows them. The wide pull-up. You’ll barely get your head over the bar. I’m Stuck At Four, Five Or Six Pull-Ups! I Got The Opposite Problem: I Got Too Good! Does this guide miss something? Do you want to share your experiences with doing pull-ups? Go ahead and let me know in the comments! 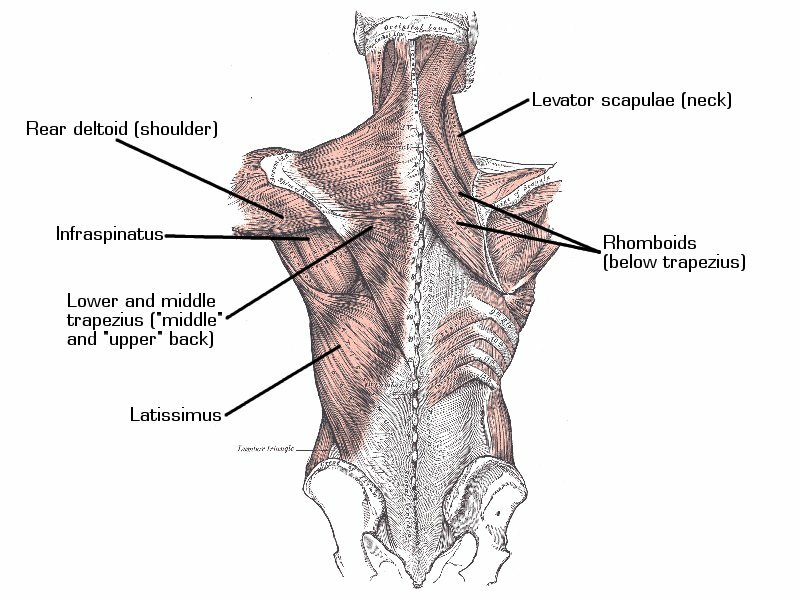 Anatomical image courtesy of Wikimedia, pull-up replacement demonstrations courtesy of Hjortur, second and third pull-up bar pictures courtesy of Drew Stephens and Eric Schmuttenmaer. With Pullups, using false grip, that is, thumb below bar promotes external rotation and puts shoulder in better position along with squeezing glutes and abs. Keeping legs straight with pointed toes is also desirable. Some people use thumbless grip, I used to it too in the beginning. With thumb below bar I can retract and depress much, much better. It’s pretty hard on thick bar, but that’s why thin bar feels like a breeze. Just to add. Kelly Starrett’s “Becoming a Supple Leopard” is fantastic book for pullup form and for form of pretty much all major exercises done. I learned that trick from him. My recommendation for next fitness book buy. I’ve done reviews of several pieces of exercise equipment. 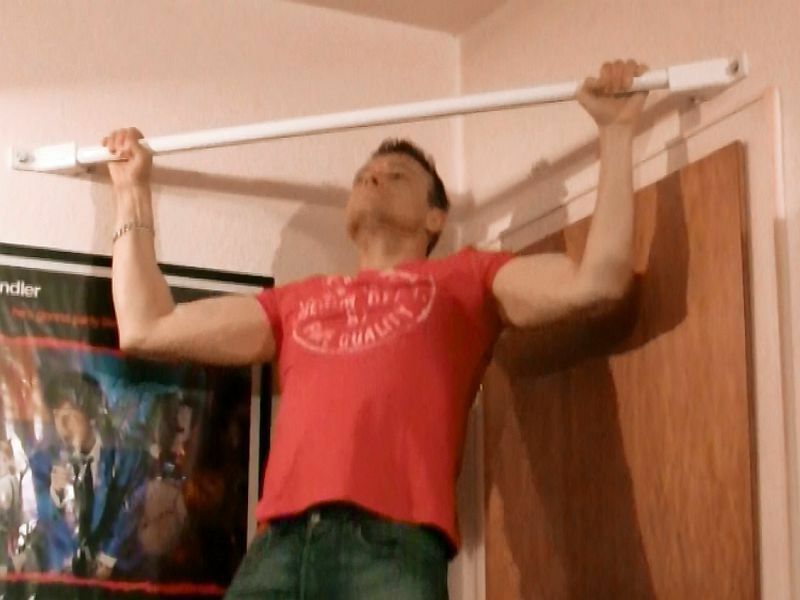 A few years ago I reviewed the Perfect Pullup (then $100, now I’ve seen it for $25. Of all the stuff I’ve reviewed, I use this more than any other, several times a week. I agree, it’s a great exercise!